Hot Scotch Man spent the first two years of his life running free in a pasture in southern Illinois. Shortly before his second birthday (July 1983), he was fitted for three weeks and taken to his first horse show, the Illinois State Fair, where he was First and Grand. The Painted Quarter Ranch acquired him a few days later, and the rest is history. "Hot Scotch" is a 1981 stallion with a phenomenal show record. He was undefeated at the first APHA World Championship show in 1984; 1st under every judge, to become the first WORLD CHAMPION 3 y/o stallion. He repeated his success in 1985 when he won first under all four judges to become WORLD CHAMPION Aged Stallion. In 1985, he also had the honor of being the nation's #1 HONOR ROLL Halter Stallion. This APHA Superior Halter Horse has earned 310 halter points, with 75 Grands. In 1987 Hot Scotch Man, earned the title of APHA CHAMPION, and achieved his ROM in Western Pleasure and Trail Horse, with additional points in Hunter Under Saddle. This sweet, gentle stallion stands 16 hands tall and weighs about 1300 lbs. His great athletic ability is no surprise because of his superb overall balance. Bred to be a Champion, Hot Scotch Man has the best of both halter and performance bloodlines. His grandsire is MAN IN COMMAND, a Two Time World Champion AQHA Stallion, Superior Halter, Superior Western Pleasure. Hot Scotch Man's dam is by TOM TOM, APHA Champion son of LEO SAN SIEMON, AQHA Superior Halter Stallion, and AQHA Champion producer. 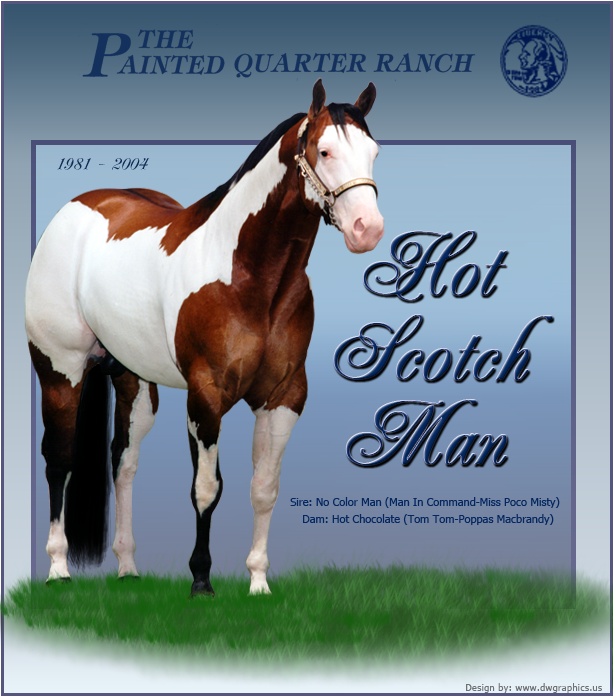 Hot Scotch is now a World Champion Sire; APHA Champion Sire; Superior Halter Sire; Multiple Futurity Champion Sire; Top 20 Amateur sire and Versatility Sire. To date, in Open, Youth and Amateur, his get have earned over 5000 points in halter, and over 7000 points in performance. These foals come from a wide variety of mares. Hot Scotch's high percentage of color on solids, and near perfect conformation have encouraged many Quarter Horse people to bridge the gap to Paints. History was made in July of 1996, when a Hot Scotch daughter, Hot Miss Te Scotch, became the highest selling horse ever in the history of the World Showcase Sale. This was topped in 1997 only by a granddaughter of Hot Scotch, JRs Onyx Affair. His son, HotWheels InMotion, is a Reserve WORLD CHAMPION, and was the Honor Roll Halter Stallion Honor Roll for 1998, with 710 Halter Points. Another son, Hot Scotch Mister (aka Frankie), won WORLD CHAMPION AGED STALLION in 2003. His get have sold all over the world, from Canada to Mexico, and Brazil to Italy. The best part of all is that the owners are excited about their "Hot" babies! This is evident in the fan mail Hot Scotch Man receives.